Betsy Deane and her granddaughter, Toria Staudinger, traveled to Olympia to witness Gov. Jay Inslee sign a grandparent visitation bill into law. Deane hopes to use the new law to win visitation rights to see her nine-year-old granddaughter. Three years ago, Betsy Deane's son was killed in an automobile accident. Now, the Pasco, Washington, grandmother hopes a new state law will allow her to reunite with the granddaughter she hasn’t been able to see since. Deane stood on the steps of the Washington state Capitol Thursday and told the story of her family tragedy. 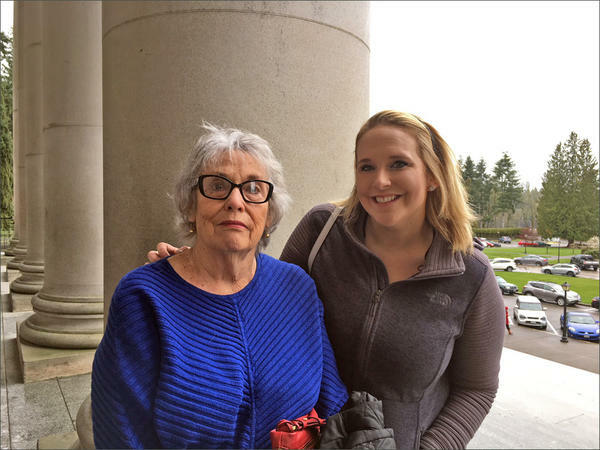 Deane is part of a group of grandparents celebrating a new Washington state law that gives relatives the right to petition a court for visitation. They traveled to the Capitol to witness Gov. Jay Inslee sign the legislation. The law has been more than a decade in the making. Since 2000, Washington has been the only state in the nation without a grandparent visitation law. That’s when the U.S. Supreme Court invalidated the state’s existing law saying it infringed on the rights of parents. Democratic state Sen. Jamie Pedersen has long been working to rewrite the law, but he said it ran into opposition from socially conservative lawmakers from both parties. “Their perspective has been that God put parents in charge of children and nobody should interfere with that,” he said. Pedersen has a different view. “This is about kids who are harmed because they’ve been cut off by their parents from contact with people who are important in their lives,” he said. The new law puts the burden on the relative to show that visitation is both in the best interest of the child and that harm will likely come to the child without visitation. Deane said she’s prepared to use the new law. But Deane said she hopes it doesn’t end up in court. Instead, she’d like to use the law as leverage to get a mediator involved to work out a visitation plan.